I am a full week behind blogging about my forts! I regret that I have not kept up with them better. I find that I sort of obsess about my blog topic for a few days and then I am on to the next one. Sometimes the topics meld into one another, but I would like to blog about these ideas as they are fresh in mind. I suppose for brevity sake, it is probably best that I am blogging a week behind. But I am going to try my hardest to catch up this week. The forty forts will be on display beginning Maudy Thursday through Easter weekend at Calvary. So I need to catch up with the descriptions and start preparing for their display. WeatherizeDC is weatherizing 200 homes by March, which in turn will generate up to seven good green jobs, save homeowners up to 30% on their energy bills and offset 3,645 metric tons of carbon. I love the idea and I am dying to have an energy audit on our condo. I am certain that we would be shocked to see where all of the cold air is rushing in. I can feel it in really strange places, like the key hole on the door frame of our master bathroom closet. And don’t even get me started on our second refrigerator, which was also call Lucy’s nursery. That is in the winter time. In the summer, it is a little oven as it faces the southeast corner. Heather taught us about The Stack Effect and myths about weatherization. I plan to host a party in our condo this spring if you are interested in learning more. We plan for it to be specifically geared towards condos. I had hoped to host a party in February, but we were facing the bold effects of climate change with our record-breaking snow storm. and the importance of space, I realized one of my goals. 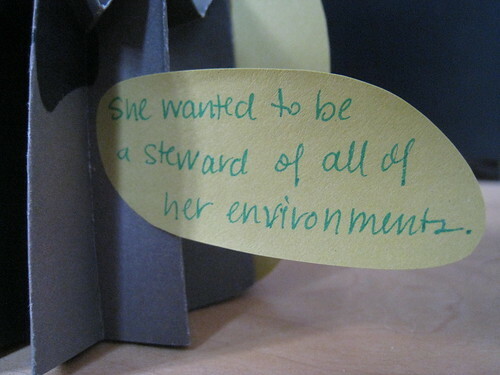 She wanted to be a steward of all of her environments. The shape of the actual fort ended up a little uneven. But I thought that made it perfect for this piece. I knew that I wanted to seal off the gaps with the green paper. 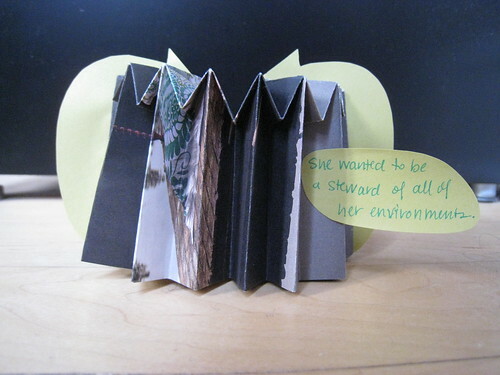 I shaped them into arrows to mimic The Stack Effect and the reduce-reuse-recycle symbol. 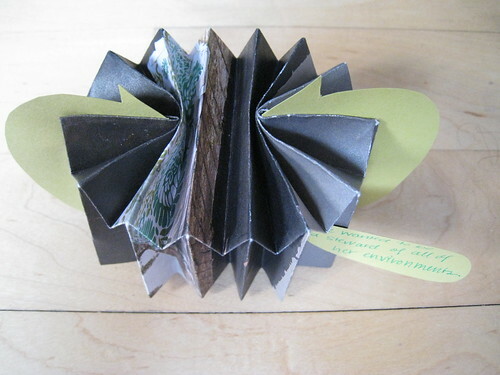 This paper sculpture, roughly the size of a coffee cup, is one of forty forts I created during Lent 2010 as a creative exercise and spiritual exploration. Read about all of the Forty Forts.